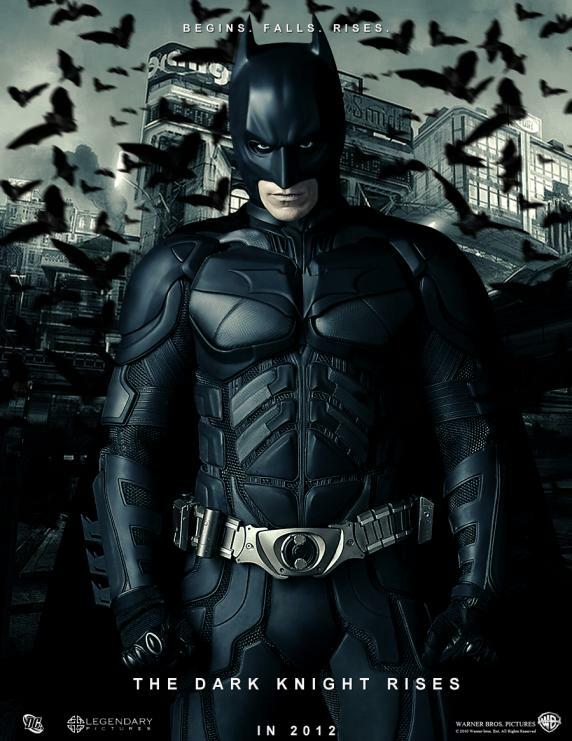 Warning: There may be spoilers here for The Dark Knight Rises, The Dark Knight, and Batman Begins (depending on your preferred level of movie purity) . Also: my most sincere thoughts and prayers to the families and friends of those caught in the shooting in Colorado. 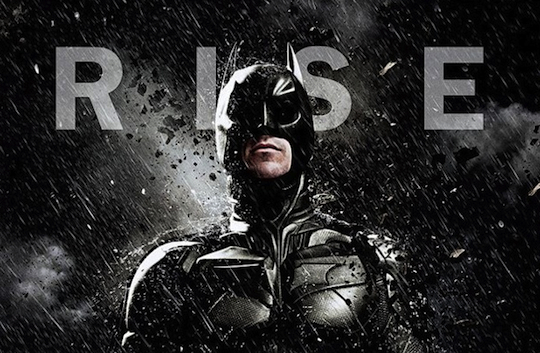 Director Christopher Nolan‘s final installment of his necessarily complex Batman Trilogy, The Dark Knight Rises, is an all encompassing and captivating vision which crackles with intention and ends with a gratifying bang. This film is a masterful slight of hand, diverting attention with smirking distractions. The intricate plot delivers a coquettish feel as layer after layer is stripped away until we see exactly what this movie is made of. With a nearly three hour long run time, this tease could easily have become monotonous and unrewarding, but instead each reveal leaves us breathless and wanting more. It is impossible to talk about The Dark Knight Rises without delving into its predecessors: Batman Begins and The Dark Knight. The writing in TDKR relied heavily on previous plots, but never once did the material feel belabored or recycled. Instead of sloppy covers for plot gaps unforeseen at the beginning of the franchise, the interwoven back story of the third film leaves the viewers wondering if it had been there all along and they were simply too short sighted to see it. The writing team, helmed by the Nolan brothers, focused on the overarching theme of ‘finish what you start’ as it resonated not only with the characters in the film, but the personal commitment of C. Nolan to see this incarnation of Batman through to the bitter (but oh so delicious) end. 1.) a person or thing that ruins or spoils. 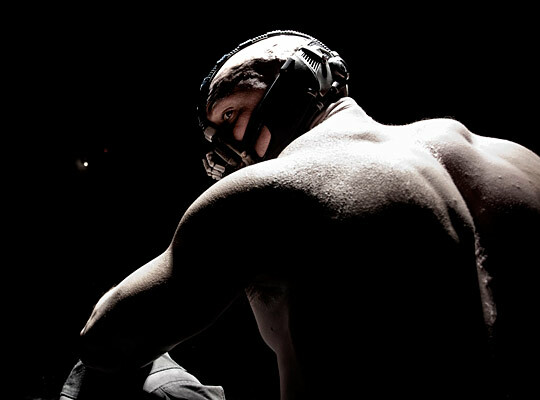 The central villain of the film is Bane [see photo above], as played by an unrecognizable Tom Hardy, but lacks the maniacal chaos given us by Heath Ledger‘s Joker. He also doesn’t bring the unexpected bite of betrayal provided by Liam Neeson‘s Ra’s Al Ghul. What Hardy’s Bane gives us is a calculated theater of fear and pain. Bane gives us the definition of darkness and devotion with such an ironic malevolence that you can see the smile in his eyes. He drives forward the action by being the one thing that inspires a reclusive Bruce Wayne (Christian Bale) out of superhero retirement. Bale fully flexes his acting muscles as a Bruce Wayne so tormented by past demons that he is physically crippled. Bale indeed rises to the occasion and plays the split between Bruce Wayne and Batman with such vulnerable heroism that you can see with more clarity than ever that Wayne needs Batman just as much as Batman needs Wayne. We witness the full circle of his training where he doesn’t conquer fear, but harnesses it and ultimately uses it as a strength. We strain along side him to save his beloved city one last time – no matter what the price. We agonize with him as he struggles for both metaphorical and literal freedom. One of the most interesting additions to Bale’s interpretation of Batman is his reactions to the new beguiling females in his life. The women of TDKR were a surprising change of pace from the one-dimensional Rachel Dawes (played by Katie Holmes and then Maggie Gyllenhaal) in the first C. Nolan installments. Anne Hathaway was refreshingly mature in her performance as red pouted Selina Kyle and her masked alter-ego Catwoman, while Marion Cotillard‘s multifaceted Miranda is winsomely self-serving. Another new face to the series, Joseph Gordon-Levitt, brings “hot-headed” inspiration to a haggard Commissioner Jim Gordon portrayed with such beleaguered weariness by Gary Oldman that you can feel the time that has passed in C. Nolan’s Bat-universe. Morgan Freeman‘s wise Lucius Fox presents us with a masterful offering of stoic leadership and nudging humor. I cannot even think about Michael Caine‘s tender performance as Bruce Wayne’s ever-steady butler, Alfred, without crying. Hans Zimmer‘s score is breathtaking as usual, and perhaps made more so by C. Nolan’s directoral choice to omit it from a few climactic scenes. The most notable lack of underscore is the initial showdown between Bane and Batman. You hear every thud, crack, and breath of battle without the often unrealized cushion of music to soften the blows. That paired with the extended shots of brutal fighting makes for an unrelenting duo that grips the audience and forbids them to look away. The emotional resonance of this piece is perhaps its most astonishing accomplishment. This is so much more than a blockbuster action flick . It has much more to offer than just special effects and cool gadgets (though there is plenty of that to go around too). This cinematic epic captures not only our minds, but our hearts and our values. It begs us to consider complex concepts such as redemption, sacrifice, and true freedom. It asks us “can you ever really start over?” and “What does it mean to give everything?”. It ponders an unsettling reality that truth cannot stay hidden forever, and hiding it (no matter how noble the intentions) will have repercussions. It gives us pause to consider the masks we wear, and the masks of others. It compels us to finish what we start. It is superhero movies like this that make The Avengers seem like pointless fluff. I have few gripes with the film. Most of them regard a subplot I felt unnecessary to the final composition. I would have much rather seen the five minutes of screen time taken away from that aspect and given to more interesting developments. Bane was difficult to understand at times, which is a shame because the dialogue was so purposefully crafted and crucial in so many aspects. I wouldn’t go so far as to suggest subtitling his lines, but I do wonder what inspired their final decision for his voice. Overall, however, I think this film and the trilogy as a whole will go down in history as one of the great epics of cinematic storytelling. Now if only Man of Steel lives up to the example set by these films – I’ll be set for life. Thaaaaanks! I’m glad you enjoyed it. Spot on, and superbly written. Deft, keen and way perceptive. Totally cool.